Building from a foundation of rapid innovation, the 21st century is poised to offer considerable new approaches to providing modern diabetes care. The focus of this paper is the evolving role of diabetes care providers collaboratively working with patients and families toward the goals of achieving optimal clinical and psychosocial outcomes for individuals living with diabetes. Advances in monitoring, treatment and technology have been complemented by trends toward patient-centered care with expertise from multiple health care disciplines. The evolving clinical care delivery system extends far beyond adjustment of insulin regimens. 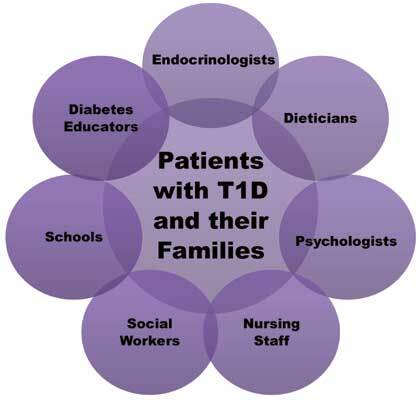 Effective integration of patient-centered strategies, such as shared-decision making, motivational interviewing techniques, shared medical appointments, and multidisciplinary team collaboration, into a dynamic model of diabetes care delivery holds promise in reaching glycemic targets and improving patients’ quality of life. Diabetes self-management, glycemic control, multidisciplinary team care, patient-centered care, pediatrics, type 1 diabetes. Children`s Hospital of Richmond at VCU, Brook Road Campus, 2924 Brook Road, Richmond, VA 23220-1298, USA.